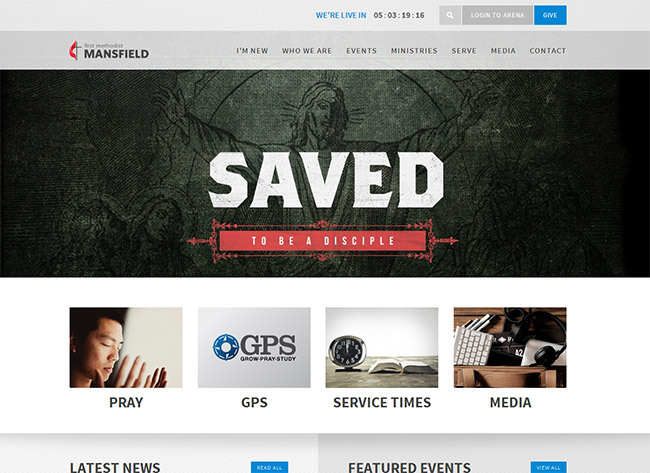 For many churches, their website is an invaluable communications tool. Their website can be extremely useful for helping new people to find the church, which can increase the growth of the church. Also, the website can help regular attendees and church members to get information on programs and events at the church. 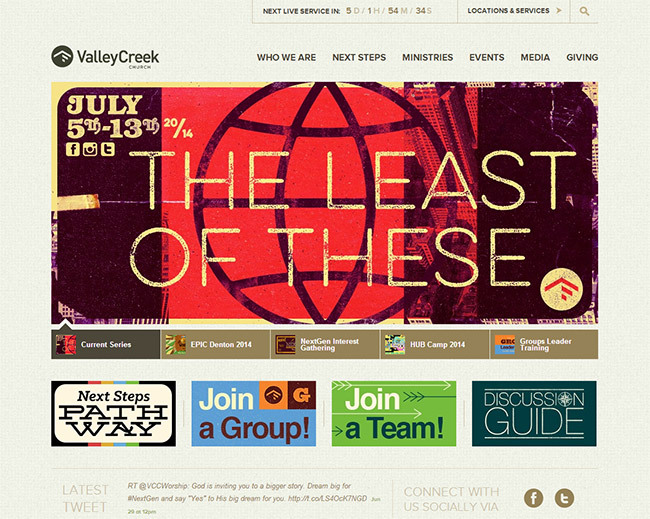 Despite the enormous possibilities for church websites, many of them are ineffective. 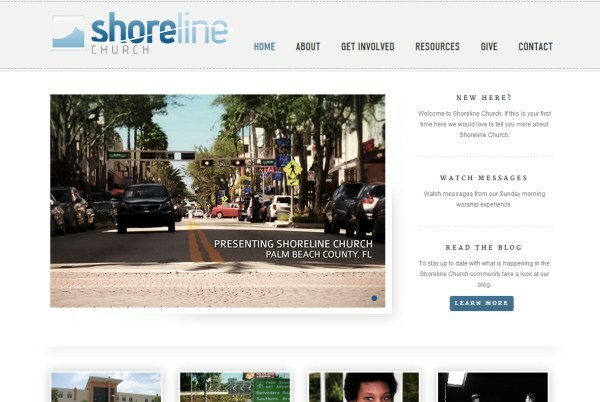 With that in mind let’s take a detailed look at the subject of church websites, what makes them effective, and showcase some of the best examples of church website designs. If you are designing a church website there are some specific things that you will need to keep in mind in order to maximize the effectiveness of the site. 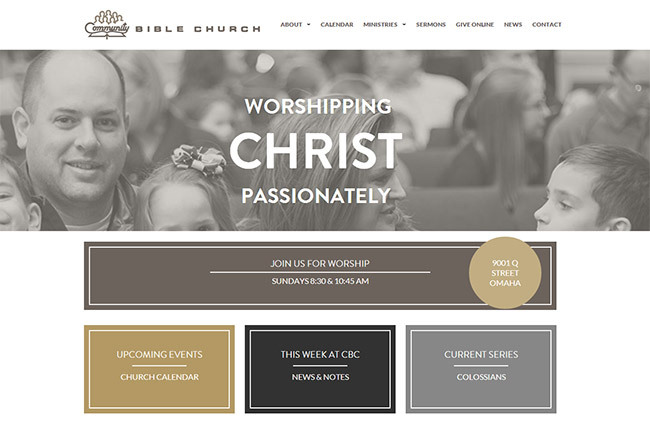 Here is a quick look at some of the most important elements of church websites. There are two primary audiences for most church websites, and these audiences have very different needs. The first audience consists of church members and regular attendees, and the second audience is people who are looking for information about the church. Members and attendees will typically visit the site to look for information on upcoming events or specific ministries of the church. People who are considering visiting the church will likely be looking for things like the location (address or directions) service times, and what the church believes or practices. In order for a church website to be effective it must address the needs of both of these audiences and make it easy for them to find what they are looking for. In recent years a number of churches have been moving to platforms like CongreGATE for managing the needs of the church body, which leaves the church website to primarily serve people who are new to the church. Each church has its own culture, style, and practices. 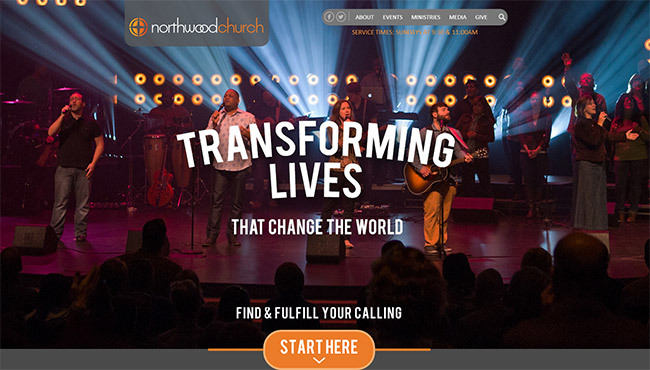 Website visitors who are looking for a church will typically want to have an idea of what they should expect if they are to visit for a worship service. Will it be traditional and formal, or more contemporary and informal? 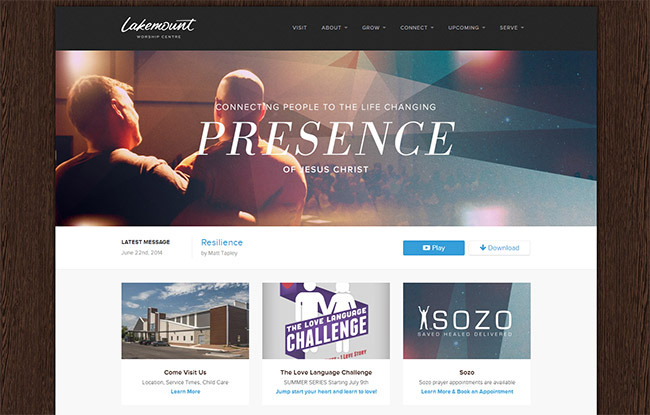 Websites can and should do an effective job of communicating the churches style and culture for those who have never attended. The website should clearly list the schedule of services (dates and times) as well as the address or location. Make it easy for website visitors to know when and where they should be if they want to visit the church. If the church has multiple services or multiple locations, provide plenty of information to explain the situation to those who have never attended a service. This information should be no more than 1 or 2 clicks from the homepage, and it should be extremely easy to find. 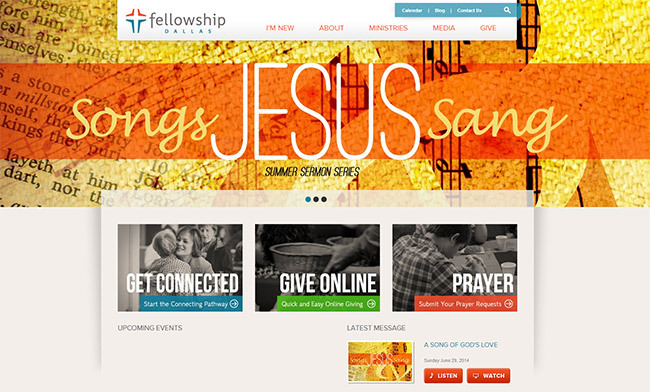 Some websites visitors will want to be able to find out what ministries the church provides. Church members and attendees could be interested in this information to find opportunities to get involved, and those who are new to the church may want to see what a church has to offer, or they may be looking for a specific program or ministry. The website should provide at least basic information on the various ministries of the church, and ideally contact information for someone involved or in charge of the ministry. Some of the website visitors will be arriving to find contact information, like a phone number or email address. Every church website should include at least a phone number for the office and a contact form that can be filled out. Many churches also include contact information for pastors and staff. Like any type of website, visual appearance counts. While the design is not as critical as the content and information, making a positive first impression requires an effective design. In today’s world it is also helpful to have a responsive design in order to preset the site effectively to visitors on smartphones and tablets. Now let’s dive in and take a look at some well-design church sites and see what makes them stand out. Classic colors and a simple clean layout give this template design a very sophisticated and versatile look. The navigation gives churches a lot of options for what to include on their website including sermons, events, and–my personal favorite–a page to post families who are members of that church. This template is fully responsive and completely customizable. 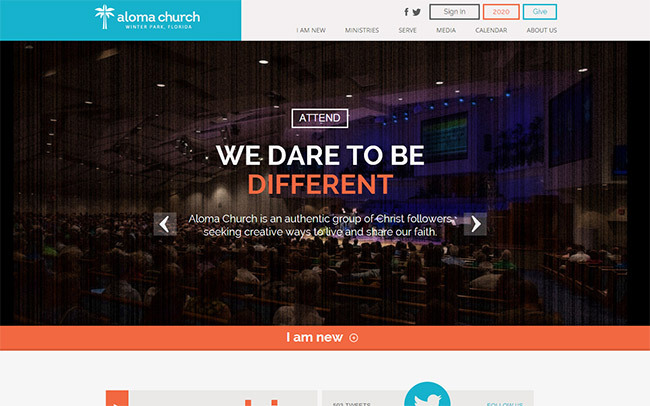 The bright cheery colors used in this site’s design are visually inviting. This website is a one-page website, but the clean, simple design organizes the wealth of information in a way so as it doesn’t look at all cluttered. This template is another fully responsive template so it will look great on mobile, tablet or desktop. And the best part…. it’s FREE! The design of this site uses a fairly simple style, but it looks great and is user friendly. The navigation has been thought out very out. The “Times & Locations” link in the header stands out, making it easy to find. Other navigation links like “I’m New”, “Next Steps”, and “Get Help” make it easy for website visitors to find what they need. 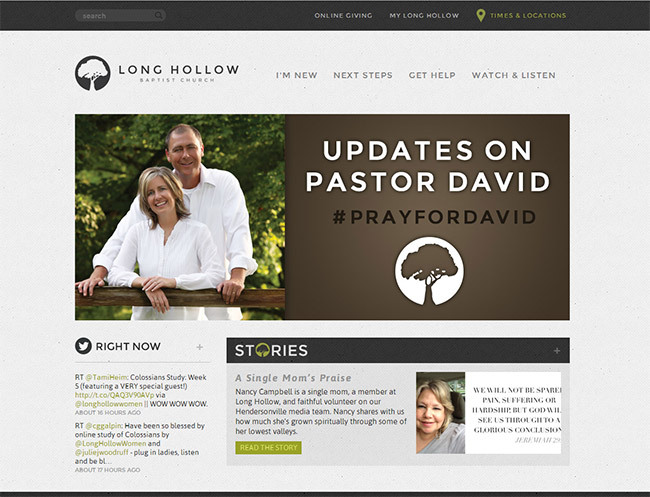 The “My Long Hollow” link in the header allows church members and attendees to login and access relevant content. This site has a very un-cookie-cutter-like look and feel that makes it stand out. From the large image on the homepage, to the bold typography and colors, it is a unique design. Right in the middle of the homepage you’ll find links for driving directions, service times, and contact information. All of these are important elements and this design gives them the priority that they need. The sticky header is a nice touch that makes navigation a little bit easier. This design and layout is also responsive, so it works well on any device. The design uses a nice subtle textured background that has an impact without being overpowering. The “Who We Are” and “Next Steps” links in the navigation menu provide easy-to-find information for anyone who is new to the church. The “Locations & Services” link at the top of the page is easy to find. Social media is also incorporated into the website. The “I’m New” link in the main navigation gives first-time visitors the information that they need. The color scheme of this site helps to make the design look great. 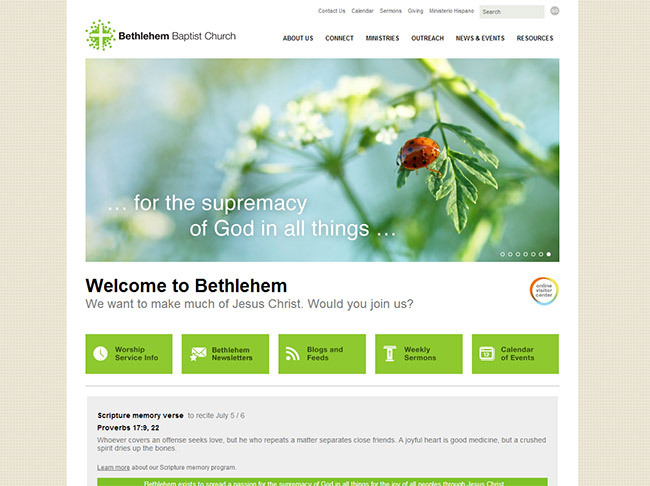 Below the slider you’ll find graphics and links for “Get Connected”, “Give Online”, and “Prayer”. These graphics look great and they also help with making the site easy to use and navigate. The “Calendar” link in the site’s header makes it easy for church members and attendees to find the details of upcoming events. The overall design of the site looks highly professional and presents a positive first impression. This is a multi-location church, and in the header you can use the dropdown to get information about all three of their locations. Service times are easy to find thanks to the button in the header. The homepage includes an “Our Mission” sections with a link to more information. This is the type of content that many first-time visitors will want to find. The homepage uses a color scheme that gets attention. The design and layout is responsive and looks great on large or small screens. Locations and service times can be easily accessed from the navigation menu. The “About” section, the dropdown links listed under “About”, provides relevant information for anyone who has never visited the church. The full-screen slider on the homepage presents a powerful visual impact for website visitors. The slider uses quality photographs and looks great. The color scheme is attractive. The green color is strong, but since it is used sparingly it is not overpowering, and it helps to cause specific elements in the design to stand out. There is a lot of information on the site and many pages, but it is well organized and the drop down navigation makes it pretty easy to find something. The “online visitor center” (linked just below the slider) provides all the information that first-time visitors would need. The overall design of the site looks great, including the slider on the homepage. Service times and directions are very easy to find, with a link at the top of the site. Major sections of the site are easy to find with clear navigation. The area below the slider includes links to “online services” and “I’m new here”, which are likely to be among the most important areas of the site. Social icons in the header make it easy for visitors to connect via their favorite social media site. The main navigation links are clearly communicated and make navigating the site pretty easy. 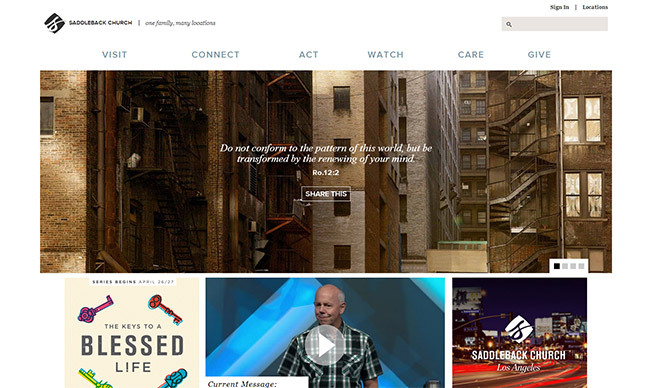 The “I’m New” and “Who We Are” links, the first two in the navigation menu, make it very easy for people who are new to the church to find the content and information that they need. Other important items like service times and directions are also easy to find. The homepage slider makes a strong visual impact. 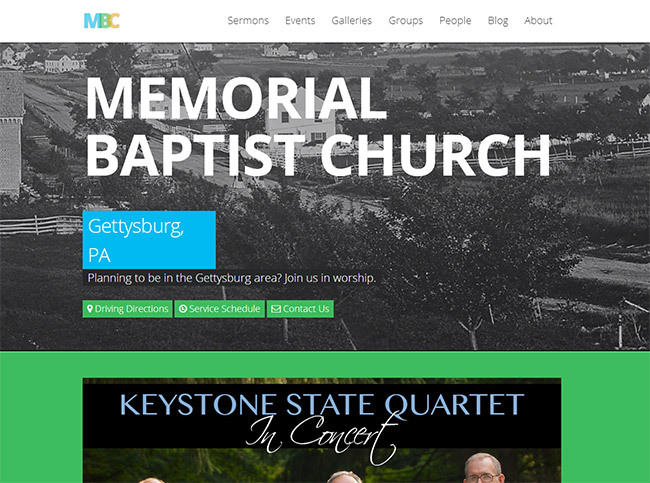 The full-screen slider on the home page makes a strong visual impact and allows the church to promote certain events and ministries. 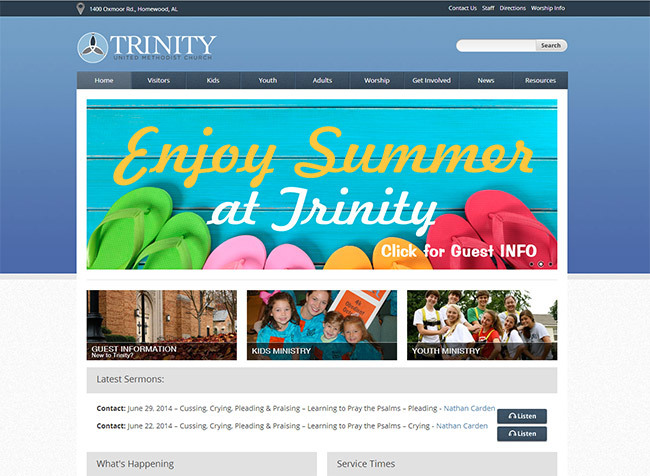 The “Plan a Visit” link in the main navigation provides first-time visitors with the information they will need for their first visit to the church. The design and layout is responsive, so it works well on tablets and smartphones. The huge slider on the homepage gives this site a memorable appearance. Below the slider are links which are helpful for finding some of the more important content on the site. The “Start Here” link on the homepage can’t be missed. From there you can get information for a first visit, learn about becoming a church member, learn about the ministries of the church, find a place to serve, and more. The full-screen slide makes a strong impression, and the photos and graphics used in the slider look great. Service times are listed clearly in the header. The navigation menu items (I am New, Ministries, Serve, Media, Calendar, and About Us) make the site logical and easy to navigate. The color scheme is appealing. The responsive layout looks good on a desktop, tablet, or smartphone. The homepage slide gives information about service times, and that information can also be found below the slider. The design and layout are very clean and professional-looking. The dropdown navigation under “Who We Are” and “Connect” make it easy to find specific information. Service times and locations are very easy to find right from the homepage. Facebook and Twitter links make it easy for visitors to connect on social media. The buttons on the homepage for “I’m New Here”, “Connect”, “Go”, and “Media & Resources” make it easy for visitors to find important information. Overall the site is easy to navigate and well designed. The site uses a nice design with a wood background, attractive header, and clean content area. The “Visit” link (first link in the navigation menu) provides all of the information needed by those who are new to the church. The dropdown menu links help to make the site easy to navigate. The most recent sermon audio file can be easily found on the homepage. This is something that many attendees will look for when they miss a service. There is a lot going on at the homepage with a lot of different graphics, but the links in the main navigation give the site a clear structure. Those who are new can get the information they need from the “Visit” link. The site’s design and color scheme is rather simple, which allows the photos and graphics to stand out. The layout is responsive, so it provides a good user experience on any device. The clean design style looks great and present the content effectively. 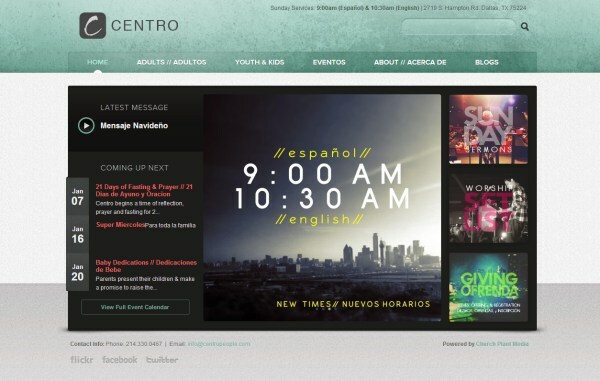 On the homepage, right below the main image, the service times are listed along with the address of the church. The design is responsive and adapts well to any size screen. The design of this site is very clean and professional-looking. 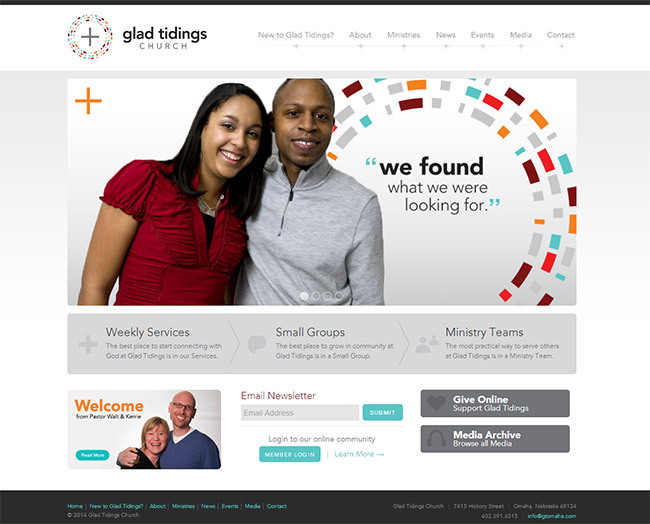 The “New to Glad Tidings?” page (included in the main navigation menu) provides all of the relevant information for anyone who is new to the church. The design is responsive and looks great on devices of any size. Although the design and layout is pretty simple, it does look professional and presents a positive first impression. The main navigation is logical and the most relevant information can be found pretty easily. The “visitors” page includes information relevant to those who are new to the church, and the graphic and link for guest information below the slider make it easy to find. The homepage also includes a few recent sermon audio files, a list of upcoming events, and service times. This site uses a clean, but appealing, design. The About page, the first link in the main navigation, includes all of the information for those who are new to the church. 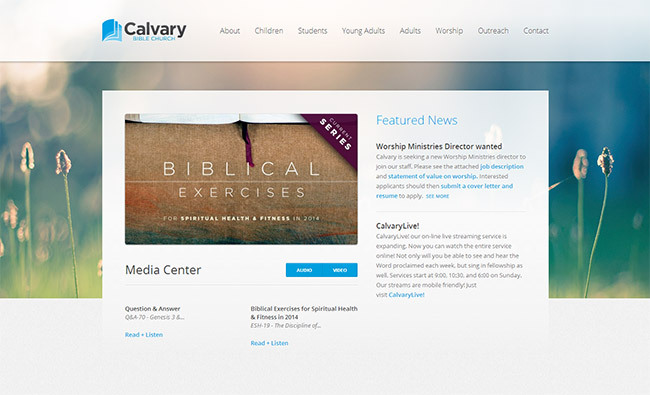 Sermon media can be easily accessed from the homepage, and ministry information can be found through the main navigation. A large and broad logo on the top makes every visitor memorize the name clearly and quickly. Drone shots of the church are displayed on the homepage. The objectives are given foremost importance as they are displayed clearly on the homepage of the site. The live broadcast is available on the site. You can request for the prayer from the site while sitting at home. Everyrthing is displayed graphically on the first sight so you do not have to go very deep down into the site. Aside widget opens up for you to join yourself up and get a newsletter on the timely basis. The web layout and content serves as the motivation for the people who want to become part of the church in some way around. A sign-up form is displayed on the homepage to fetch the emails of a large number of audience and update them on the timely basis. 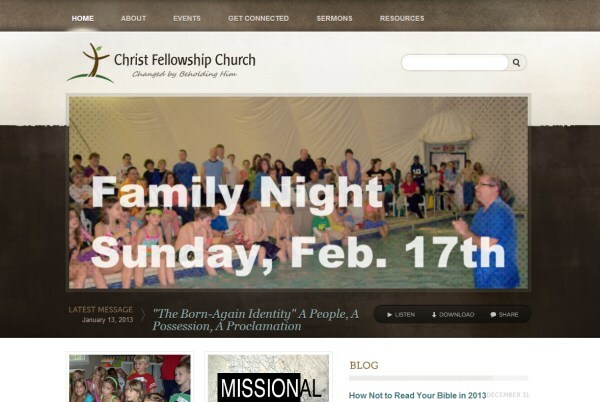 The church has a separate blog as well and this site offers the link to that blog. The images on the site show the surroundings of the church and the kind of environment that the church offers to its visitors. Each category has been categorized from other in a nice fashion. A timer is displayed on the side depicting the time left till the next service is about to be offered. The logo has been placed between the menu in a fashionable way. There is a nice, light and colorful background. Upcoming events are visible at every page as they are displayed on the footer section. Old recordings are available for viewers to listen and understand the quality of standards and worship that the church has got to offer. Strong ethical messages have been given on the homepage to engage the viewers at first instant. An often updated blog is available on the site that offers a deep understanding of religious and ethical values to the viewers. A classic calendar is available for the visitors to spot incoming events readily. The homepage has a unique look at the main gallery is surrounded by all the other categories. Sermon archives are available for people to listen to previous sermons. There is a nice broad header at the top with different images related to different categories. 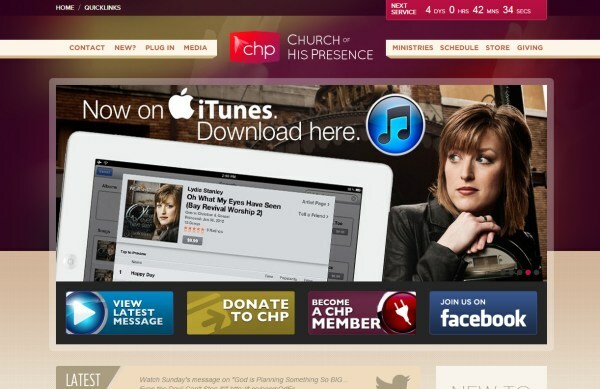 The app is available for the church and link is available on the site. You can share your own story and wait for it to be published on the site. You can give online through credit card payments without worrying much about other stuff. The website covers all the events in a deliberate way so that the people who are far away can get equal insight into all the worship events and happenings.